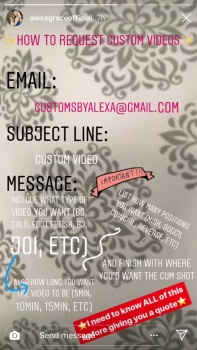 I might actually buy one of these custom videos from her. I gotta feeling she's worth the price. I think Alexa might be about to retire from the game. She hasn't post on her twitter since jan 11. She also stated she wouldn't be attending avn this year. Her goals have always geared more towards behind the camera stuff than in front of it. She was in film score when she joined the industry so I think that is where her future lies not necessarily in the adult industry either. (02-10-2019, 02:50 PM)blkknight1 Wrote: Her goals have always geared more towards behind the camera stuff than in front of it. She was in film score when she joined the industry so I think that is where her future lies not necessarily in the adult industry either. Yeah, if you read her threads, I knew she wouldn't be in the game for long. But now, I think she maybe leaving sooner rather than later. Would be a great shame, really like her. Still, going behind the camera doesn't necessarily mean we'll lose her entirely.